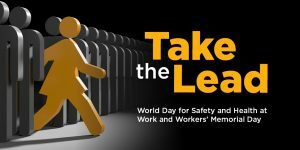 Friday April 28th 2017 is World Day for Safety & Health at Work. This day is also Workers Memorial Day, where we remember those who have died on the job & consider how we can prevent future workplace incidents. On Friday 28th April, make sure you take a moment to consider the health & safety of yourself & your colleagues & how you can reduce the risk of workplace accidents.